It’s Thanksgiving today in Canada so I thought I would share a picture of where we were on Thanksgiving during our RTW trip. 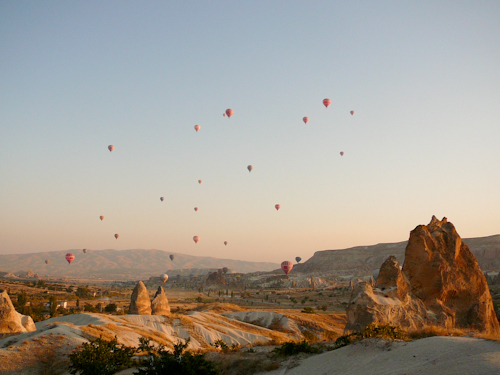 Traveling around in Cappadocia Turkey is like traveling in a different world. The ‘fairy chimney’ geology creates a surreal scenery that is unlike any I have seen before. The underground cities and deep history tell a fascinating story of marauding invaders and innovative residents. One way to enjoy the scenery is to view it from the air. We got up super early one morning to watch the balloons slowly, quietly rise into the sky. Stunning. Happy Thanksgiving! Love the picture, brings back great memories of a truly magical place. You must have had to get up pretty early to hike up and snap that picture. We did get up very early! It was hard to convince Jason it was worth it…but it totally was!! Just got back from Turkey last weekend, and this TOTALLY takes me back – I have a fear of heights, and someone said “if you are going to do a hot air balloon ride anywhere on the planet, this is the place” and they were not kidding. I was not affected by the height whatsoever, because I was too busy being captivated by the beauty of the landscape around me, as well as being in awe of the 70+ other balloons in flight at the same. MAGICAL!!!! Thanks for taking me back. Magical is a great word for the area. We didn’t actually go up in a balloon (budget won out…) but man I wish we had! Between this sight and the call to prayer I would say that Turkey definitely earns ‘magical’! yes, the call to prayer was one of the biggest surprises for me, and a pleasant one I must say – to be honest, I thought I would find it annoying, especially the 5:30am one, but it was the most peaceful, calming thing I have ever experienced. I have heard it said that it doesn’t necessarily have the same affect in other islamic countries, and this was our first, but I agree whole heartedly – M A G I C A L ! Gillian, this photo is amazing!